You know, it’s really unfair that only certain people get to make billions on the inability of some consumers to make their house payments each month. It’s also unfair that insurance company executives make money by sometimes disregarding the health of their policyholders. Of course, I’m so distracted by figuring out whether or not Sandra Bullock is going to divorce Jessie James that I pretty much don’t pay attention to these things I mean, after all, what is really more important here? But, lucky for me, I somehow managed to wade through the media not-news topics to find out what has been going on in the financial and insurance industry lately. 1. Predatory lending: I just heard that my neighbor lost her job and is really in a financial bind. I’m going to give her a loan with her home as collateral (let’s say a 50% loan to value ratio). I’m not going to vet her and actually try to determine whether or not her financial situation indicates that she can pay back my loan—after all, I’m just a lender. It’s not my job to make sure she can pay me back. As such, I’m also not going to ask her for documentation of any of the financial claims she makes in order to get my loan. But the beauty of this is that I’ll profit even if she can’t pay me back because I’m going to sell pieces of her loan as a 1-person mortgage backed security to the people on the next street over who don’t know that she can’t afford my loan. I’ll explain to them that they will earn money on their security as she pays off the loan. Maybe I’ll even pay another trusted neighbor to rate the security as a good risk. Not only will I get the investor’s money for buying into my security but I’ll also own my neighbor’s home in a few months when she stops making payments and I foreclose on her. Since her loan is less than the value of the home, I will make a profit from selling it. 2. Short selling: Since I know that my neighbor has lost her job and is in dire financial straits, I’m pretty sure she’ll sell anything she owns for a little bit of cash. Also, since I know that her car’s been leaking oil (she hasn’t noticed this yet), I know her car isn’t actually worth what she thinks it is worth. Of course, the people on the next street over don’t know this so I’m going to sell them my neighbor’s car for $5,000. Sure it’s a short sale because I don’t actually own her car, but after I tell her about the leak and I combine that with her financial desperation, I know she will sell it to me for just $2,500. Guaranteed profit! 3. Insurance: Lastly, I’m going to offer my poor, jobless neighbor an insurance policy. I’ll be her insurer and I’ll restrict the doctors that she can visit. I’ll create my own company to determine what ‘usual and customary’ costs should be and I’ll force the doctors and facilities in her network to accept only those prices. Of course, since I’m creating my own ‘usual and customary’ costs I will just be using numbers that ensure I make a profit off of her premiums, but that shouldn’t matter—right? This will probably compel them to offer her less of their time and fewer of their tests but again, not my problem. Oh, and since she’s been unemployed for 64 days and could not afford COBRA during that time, her insurance policy through me will not actually cover any of the conditions she has that she needs covered. The system isn’t perfect, as we all know. And the blame does not lie completely on one side of the fence—after all, consumers need to have the discipline to really objectively look at whether or not they can afford their purchases, even when banks allow them to lie. But wouldn’t a little more regulation—and the actual enforcement of it—help? I’m interested to hear your thoughts on this, so please discuss below! What makes the problem in our country so dangerous right now is that we have what I think of as a fake democracy. That’s even more dangerous than having a monarchy because this way the people don’t even know to revolt. Our country is being run via big corporations via lobbyists. Every decision congress makes is based off of how much money the congressman will make and how it will effect their next election. An entire party can then become the party of no because they are looking to make money/get future votes and they have their own spin machines working to attempt to blame the other side. Same problem with the media. Sources that people assume are neutral actually have very strong biases and the people that run the networks have vested interests in the public believing a certain way. So the only way to get more regulation would be if the congressman could be convinced that voting for it will improve their chances for reelection. If the media openly reported the problems, and people paid attention, then that would be easy to do, but enough Americans have no clue about the actual cause of their problems (how many would just personally blame Obama or government for being too big) that it’s hard to get anything changed. There is a small wing of the democratic party that wants real change for the sake of the people, but most of our officials are just greedy power giants looking for the next vote. With the recent Supreme Court decision allowing corporations to spend unlimited sums of money on elections we just took a step backward toward regulation of big business, not forward. I agree with you David. This is a difficult topic for me because I am not anti-capitalism. I am anti-screwing people though. Profiting and purposely screwing do not have to be one and the same. Corporations are not people and I think SCOTUS made a huge mistake in giving them that status. I think you’re on to something! You just need a military industrial complex to launder all the sweet cash you’re going to make!!! Cookies! I agree with David as well as your analogy Yolander. Democracy in America currently consists of corporate media conglomerates manufacturing “news” and “facts” to dupe citizens into voting against their own best interests. 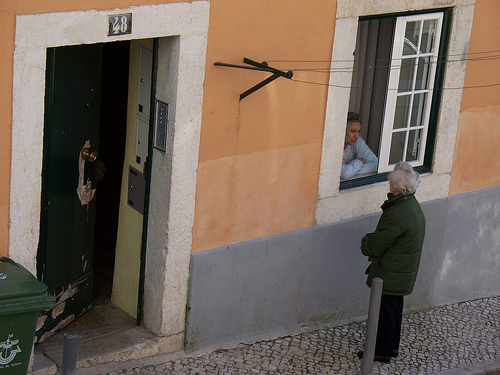 (off-topic…) That photo is in Lisbon! Where I live. small world. Really? That’s interesting. Small world indeed.